This wing riveting advice is specific to the Vans RV-8. However, it could also prove valuable to builders of other Vans kits or other aluminum kitplanes. 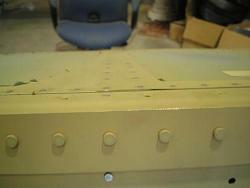 You start the wing riveting process by preparing the wing skins. The plans say to dimple the skin first, then file the overlapping corner to reduce the total thickness. If you do it in that order, the dimples get in the way while you are filing. Instead, do the filling first, then dimple the skins. I marked three inches up from the corner and placed some tape there. Then I began in earnest to file the corner down. I used a large Vixon File to take off most of the metal. I continued with it until the calipers showed the skin was half of its original thickness between the two rivet lines that join the two skins together. Then I pealed off the tape and used a scotchbrite wheel to remove tooling marks and smooth the surface. Using all three grades of scotchbrite, I continued until the skin was smooth and without scratches. Then I repeated the process for the other skin. Now you can dimple the skins. Make sure you spend some extra time on these corners when you are priming. 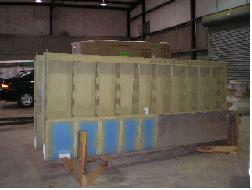 Because you have removed the alclad coating, these corners are more susceptible to corrosion. The wing riveting directions would have you wait until the leading edge assembly is riveted to the wing before installing leading edge landing/taxi lights (See Landing Light Article for details.) I did all the drilling, cutting and fitting before the leading edge was riveted together. This gave me the freedom to get to everything easily. I waited to install the lenses and lights until the wings were hung for the last time. But I did all the drilling and cutting here before I primed the parts. You will assemble the leading edge in the cradle you used earlier to fit and drill. Now put the entire leading edge assembly onto the wing spar. By reaching in through the leading edge spar lightening holes, you can buck the rivets to attach the ribs to the main spar. I can’t see that the skin would move or buckle if you installed the rivets in any order, but I followed Vans wing riveting recommendation to rivet from the center of each rib, for and aft. As I got close to the top and bottom of the rib, I started alternating between the rib and the spar. By riveting back and forth, I finished the rib as I finished the rivets on the spars behind the rib I was working on. This continued to the end of the wing. I had a friend help me backrivet the top skins. I drove the rivets, and had him hold the bucking bar. So all the skilled work was up to me, and I had only myself to blame if there was a mistake. 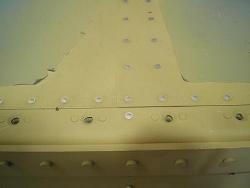 To make the process go faster, I marked the rivet callouts on the wing skin plastic coating next to the rivet holes. That way as we were riveting, we didn’t have to stop and refer to the drawing. Initially, I had pulled the electric conduit all the way through the rib holes before I started riveting. But I found that it got in the way, and had to remove it. I ended up pulling it through the wing as I worked my way down with the rivets. That way it was easy to get to, but it was out of my way as I riveted. I left the left wing lower skins off when I built the wings. At the time, I hadn’t decided what pitot tube I would use, so I waited until almost four years later to rivet the bottom skins. I left my wings in the jig to install the aileron brackets, aileron gap fairings, flap braces, and bottom skins. When I finally got around to the left wing bottom skins, I riveted them in the cradle. I found it a lot easier to do it vertically than trying to have two people reach over the bench. 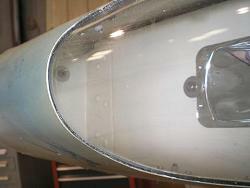 This completed the wing riveting process. Next is ailerons and flaps.